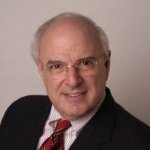 At my invitation, Arnold Garson, former Des Moines Register managing editor, shared his thoughts on lessons from the Des Moines Tribune (which died 30 years ago today). As a reporter, Arnie broke the story that the Tribune was closing. My observations on lessons from the life and death of the Tribune are a separate blog post. In a third post, I publish some Trib memories from Arnie, Ron Maly and me. 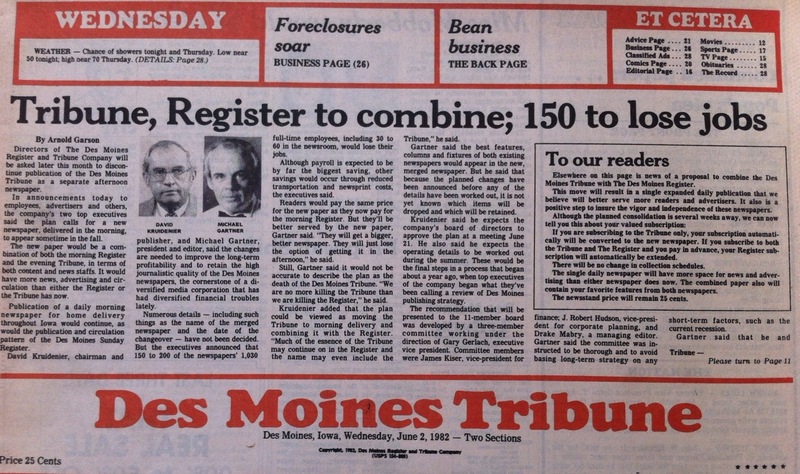 The most important lesson to emerge from the closing of The Des Moines Tribune was the lesson not learned. 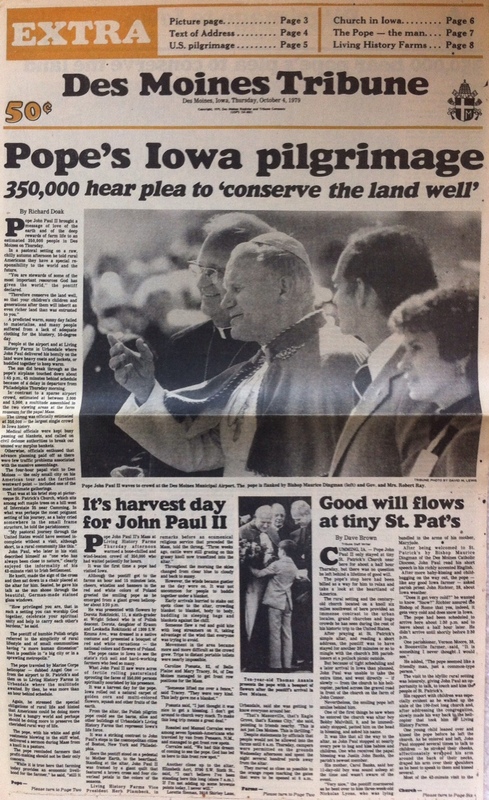 I arrived at the Des Moines Tribune as a reporter from the Omaha World-Herald in October 1969. Ed Heins, then the top Fourth-Floor news executive for The Register and Tribune, actually hired me for The Register. But before I arrived he changed his mind saying that he wanted to inject some new energy into the Tribune. Under the leadership of its newly appointed managing editor, Drake Mabry, The Tribune, which had grown a bit lethargic, would become a harder edged news product for Central Iowa and hopefully would stabilize its future. The Tribune’s new mindset: We will focus on hard news and enterprise. We will concentrate on the market our advertisers care most about. We’re as good as anybody in the business. Happily, the Tribune had a news staff that could execute superbly against this strategy and the transformation came quickly. 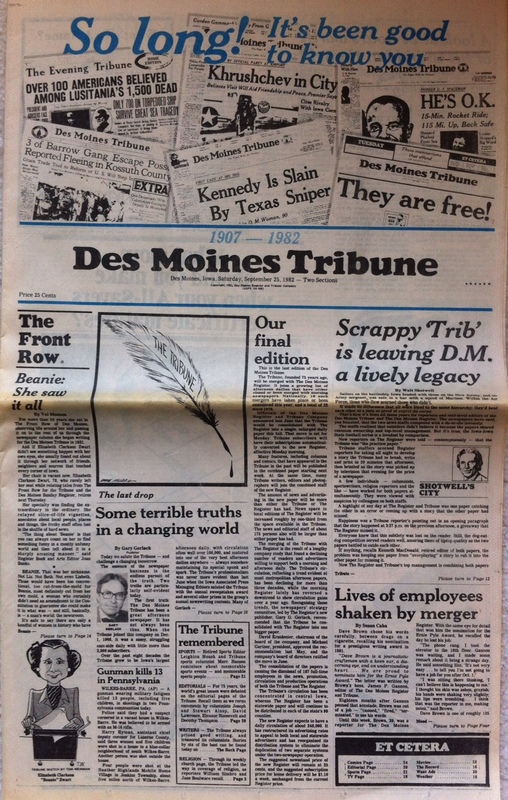 I never worked for the Des Moines Tribune, but I came close once. I interviewed for a reporting job (consumer reporter, as I recall) at the Trib in 1979 while I was a copy editor for the Register. I preferred the Register over the Tribune, but I really wanted to become a reporter and I gave the job serious consideration. I was really impressed with the pride and passion that the metro editors, Tom Tuttle and Rich Somerville (co-metro editors, as I recall, or it might have been a different arrangement), showed for their paper. They desperately wanted to hire someone away from the Register (we hired more away from the Trib, giving rise to the “practice paper” insult), but I turned down the job (angering Tom, but Rich and I later became close and remained friends until his death). As I recall, concerns about the Trib’s longevity were a factor in my decision. Soon after turning down the job, I became an assistant city editor for the Register, supervising a lot of the fiercest competition (including the Trib’s last season of legislative coverage).